I recently discovered Zaful.com and had been taken back by the amount of affordable and fashion-forward pieces they had. Whether you need a midi dress or swimwear, they have it all and there's always a sale on too which is a bonus. It is with great sadness that I announce I will not be attending Burning Man this year, although I was awarded a ticket. Needless to say, throughout the month(s) of August/September, I will mainly spend my time crying (about the fact I'm not there) and my Burning Man chummy and I will be embarking on our own private Burning Man ceremony to celebrate the memories made at Black Rock City in 2016. 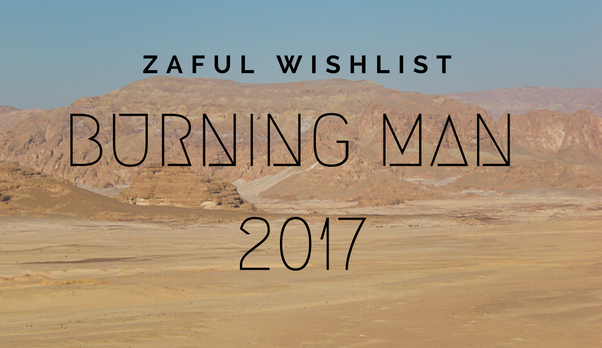 For those of you who are attending, check out my Burning Man 2017 wishlist below for outfit inspiration for this year's theme 'Radical Ritual'. If you haven't already seen my blog post about my time at Burning Man, take a look here and discover more about the eye-opening life-changing gathering in Black Rock desert. © Natalie Sung and The Science of Happy, 2012-2018. Unauthorized use and/or duplication of this material without express and written permission from this site’s author and/or owner is strictly prohibited. Excerpts and links may be used, provided that full and clear credit is given to Natalie Sung and The Science of Happy with appropriate and specific direction to the original content.